VolvoxAureus - Amy's pottery: On becoming a (very) small business owner. VolvoxAureus recently became Volvox Pottery LLC. Yep, I decided to register Volvox as a business. My reasons for registering Volvox were mostly financial. Now that I'm paying studio rent, I can write off the expense if it's for a business (I haven't heard of anyone being audited, but according to the IRS, I have to show a profit in 2 out of the next 5 years). It also keeps me from getting personally sued if my pottery hurts someone somehow (my boss's idea). I didn’t realize there would be unintended (positive) consequences of creating a business. My attitude has changed. Now that Volvox is a business, I’m thinking much more about my future as an artist and how I can be viable as an artist and a business. I’ve said before that I want my work to be more coherent, but that’s even more important now that it’s legally more than a hobby. I think more about getting work together for a show, and what it will take to get my work into a gallery, or find a space where I can show it myself. I have cards, and I actually give them to people. 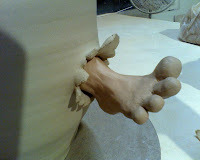 I twitter pictures from the studio to show my process to anyone who might be paying attention. At the same time, I’m trying hard not to put the cart before the horse. I know I can’t afford (and am not really ready for) my own private studio space with all my own equipment. Given that I’m only just starting to bisque my own work, I still have some learning to do before I can go off on my own. But I can't help but think about what it would be like to have my own studio, and of course the gallery I've always wanted. Forming Volvox Pottery LLC is a step in that direction and makes the possibility of having my own art-related business seem a little more possible. Someday.